For successful drug discovery it is important to understand the fundamentals of the underlying causes and consequences of the diseases for which the drug is being developed. One such physiological process in eukaryotic cells is protein phosphorylation, which is the main post-translational modification of proteins responsible for the onset or progression of Alzheimer's disease, diabetes and various cancers. Protein phosphorylation is facilitated by kinases and inhibitors of kinases act as drugs in controlling or curing these diseases by reducing protein phosphorylation. This review discusses the technologies capable of detecting kinase activity and screening candidate compounds to identify novel inhibitors of protein kinases. Keywords: Biosensors, Screening Kinase Inhibitors, protein phosphorylation, cancer, drug discovery. Keywords:Biosensors, Screening Kinase Inhibitors, protein phosphorylation, cancer, drug discovery. Abstract:For successful drug discovery it is important to understand the fundamentals of the underlying causes and consequences of the diseases for which the drug is being developed. One such physiological process in eukaryotic cells is protein phosphorylation, which is the main post-translational modification of proteins responsible for the onset or progression of Alzheimer's disease, diabetes and various cancers. Protein phosphorylation is facilitated by kinases and inhibitors of kinases act as drugs in controlling or curing these diseases by reducing protein phosphorylation. 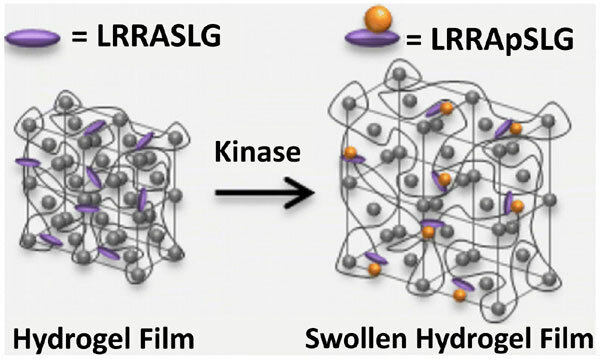 This review discusses the technologies capable of detecting kinase activity and screening candidate compounds to identify novel inhibitors of protein kinases.